You stop with your foot, just as you would a scooter. Your Strooter also comes with a rear brake to help slow you down if you choose. Since the deck rides low to the ground, you’ll find you will control your speed easily with your feet. How does the Strooter handle bumps and curbs? Use sidewalk ramps where available. 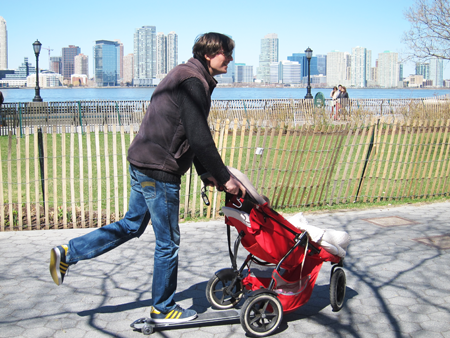 Your Strooter follows your stroller easily, gliding over bumps and curbs. Your Strooter is for cruising on mostly flat terrain and gentle inclines. If you encounter a steep hill, you will probably want to walk up. Avoid coming down a steep hill and simply walk. I've gotten to where I’m going, now what do I do with the Strooter? Your Strooter lifts off the rear axel of your stroller easily. It can hang from a strap or handle of the stroller so it’s upright and out of the way. Why is it called Strooter? It’s turns your stroller into an adult scooter. Is the Strooter easy to ride? Yes! Just hop on and go. Will the Strooter work with my Stroller? The Strooter fits many popular urban big-wheel and jogger strollers. Please select your stroller model when ordering. Safety comes first. 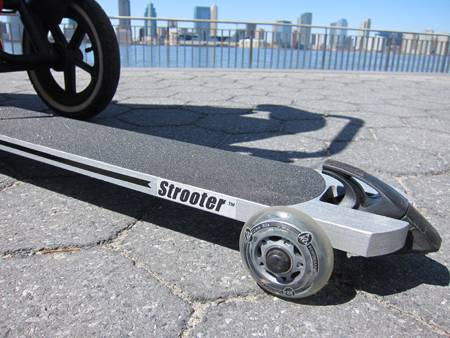 Your Strooter rides low to the ground so you can more easily control how fast you go with your feet. Your hands are on the stroller handles at all times so you’ll find the ride quite stable and balanced. Use common sense at all times as you would with any stroller.